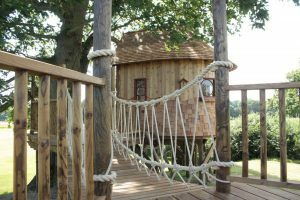 The Lookout Treehouse comprises a playful treehouse structure linked via a rope bridge to a separate play deck. 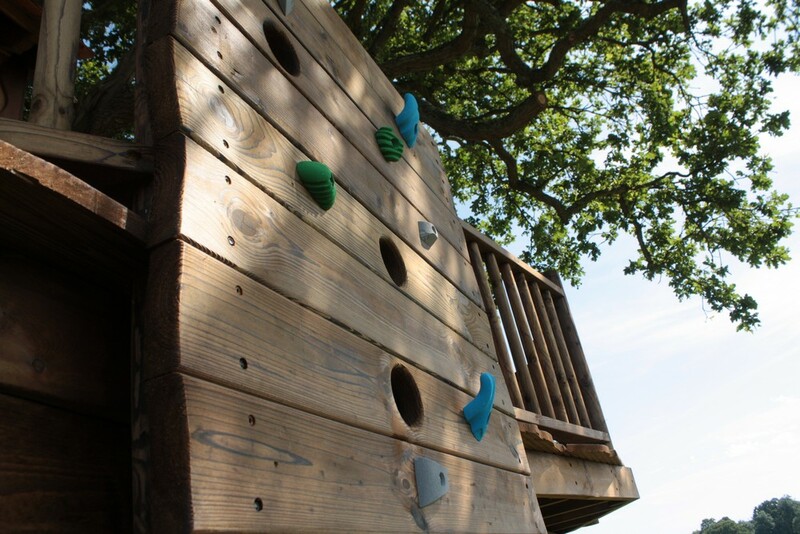 This exciting play area has everything a child could possibly wish for, encouraging them to spend hours lost in their imagination. The treehouse and decks host a variety of different play items including a climbing wall, fireman’s pole, a slide, a basket and pulley and a trapdoor and rope ladder. The interior of the treehouses is comfortable and inviting creating a wonderful playroom. 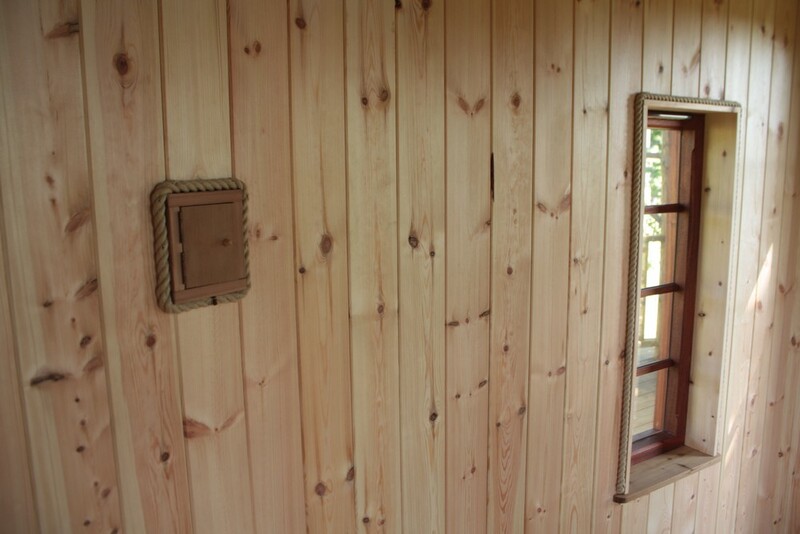 The walls are lined with Pine tongue and groove lining and edged with rope trim. There are several handmade windows to let in plenty of natural light. 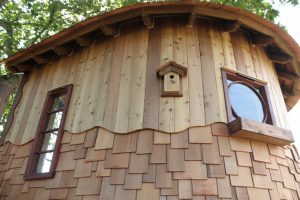 A number of round feature windows add character. 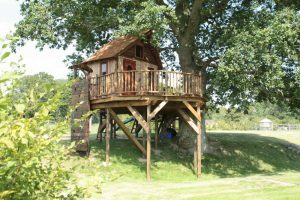 The elevated position of the treehouse provides a fantastic view across the garden and beyond to the beautiful Sussex countryside. 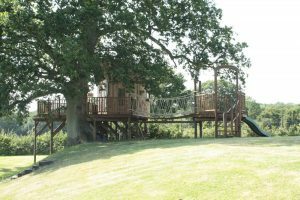 When viewed from the client’s home the treehouse provides an attractive feature for the garden highlighting the stunning old Oak tree in which it has been built. I cannot fault anything. 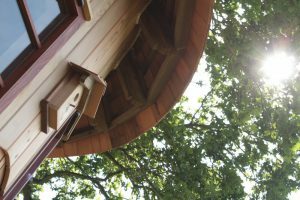 The team were a total delight; Their workmanship & professionalism were first class. We are thrilled with the result & the whole process has been really good fun! This oval-shaped treetop pavilion is built in the garden of a country house in Surrey. 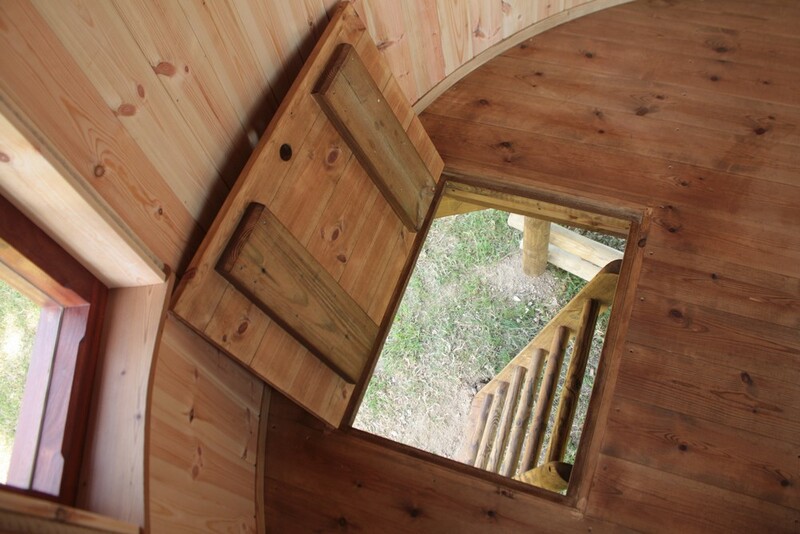 The treetop deck can be accessed via a spiral staircase. The deck is big enough for a selection of wicker chairs with comfy cushions. Built for Aldro Preparatory School, this treehouse is situated on an island in the school lake. The treehouse was named by the school pupils. The name "The Crow's Nest" fits in well with both the building’s maritime theme and the birds that live in the tree!